Please note that most products featured below are ordered in upon request. UNFORTUNATELY WE CANNOT GUARANTEE AN EXPIRY DATE OF ANY LONGER THAN 6 MONTHS ON THE VACUTAINER TUBES. Bionector is a latex-free 7 day/150 access, closed, needle-free I.V. 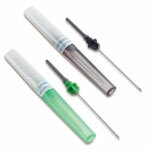 access system, which minimises the risk of infection and eliminates the risk of needle-stick injury during I.V. access. 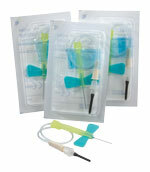 When Bionector is in place you can infuse, inject, sample blood, and change your I.V. tubing without opening the I.V. system. A simple 150cm polyethylene extension line with male to female luer-lock connections. 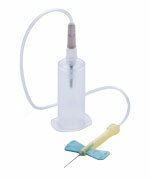 Narrow bore to minimise priming volume, ideal for drug infusion in animals of all sizes. Curos® Port Protector is a simple, innovative and disposable medical device that guards against infection by keeping luer-activated needle-free access devices protected and clean. Dramatically more effective than a standard alcohol swab in reducing bacteria counts, Curos® is clinician preferred for safeguarding patients from bloodstream infections. BD Connecta™ is the result of BD's continuous search for improvement and commitment to risk management in IV Therapy the new grade of polycarbonate and high standard moulding technique contribute to improved resistance to cracking. BD Connecta™ offers the possibility to feel whether the stopcock is completely open or closed through the on/off snaps. 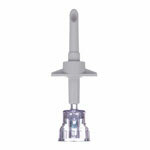 BD PosiFlush™ Syringes have a 10ml diameter for lower injection pressure, increased patient safety and minimize blood reflux that can be associated with flushing when using a standard syringe. 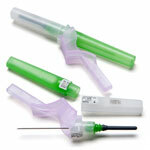 When the individual syringe package is opened, sterility of the syringe contents is maintained by a tip cap and plunger stopper, which create a sterile barrier. The safety IV sterile cannula features a self-activating safety clip that automatically shields the needles' sharp bevel when the needle is retracted, preventing needle stick injuries. Specialising within cataract surgery, the Steriseal range of cannula ensures the ideal instrument is available for every stage of the procedure. Single-handed safety activation with irreversible locking mechanism, confirmed with an audible click. Below is just a small selection of the Vacutainer® Blood Collection Tube range available, please contact us with your requirements if you do not see the item listed below. 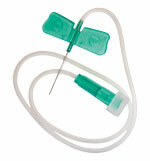 For use with catheter, hypodermic needle or any female luer fitting. 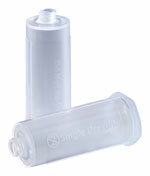 Single-Use holders for use with multi-sample needles. 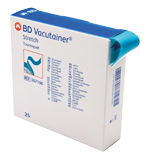 BD Vacutainer™ Flashback blood collection needles. 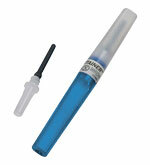 BD Vacutainer™ Precision Glide™ multiple sample needles.